108 posts categorized "Legal "
(09-22) 15:41 PDT San Francisco -- Two prominent East Bay marijuana advocates got clearance from the state today to try to put a pot-legalization initiative on the November 2010 California ballot. Richard Lee, executive director of the medical marijuana dispensary known as Oaksterdam, and Jeff Jones, former director of the Oakland Cannabis Buyers' Cooperative, are the sponsors of a measure that would allow anyone over 21 to possess or grow marijuana for personal use. It would allow each local government to decide whether to tax and regulate marijuana sales. The secretary of state's office approved the initiative for circulation along with a similar measure sponsored by John Donohue of Long Beach. Each needs at least 433,971 signatures of registered voters by Feb. 18 to qualify for the November ballot. The Lee-Jones initiative would legalize possession of up to an ounce of marijuana. Lee says it would generate billions of dollars in tax revenue. Marijuana possession, cultivation and sale would remain illegal under federal law, however. After California voters approved the nation's first law legalizing medical use of marijuana in 1996, federal authorities raided local pot clubs, prosecuted growers and sought to punish doctors who recommended the drug to their patients. LOS ANGELES – Kanye West has pleaded not guilty to misdemeanor charges stemming from a scuffle with a paparazzo last year. Los Angeles City Attorney's spokesman Nick Velasquez says West entered the plea through his attorney on Friday. The 31-year-old was not in court. City prosecutors charged the rapper with misdemeanor battery, grand theft and vandalism. West was arrested on Sept. 11 after an incident in which he was shown breaking a paparazzo's camera flash at Los Angeles International Airport. West's attorney, Blair Berk, declined to comment on the plea. The next scheduled hearing in the case is July 15. OAKLAND, Calif. -- John Burris, an Oakland civil rights attorney hired by the family, will hold a news conference about the shooting at his office at 11 a.m. Sunday.Burris said he will discuss the legal ramifications of Thursday's shooting of 22-year-old Oscar Grant, who BART officials say was unarmed when he was shot by a BART police officer.Family members and friends of Grant, as well as witnesses to the shooting, are also expected to attend the news conference, Burris said.The news conference will take place at 7677 Oakport St. in the fifth floor conference room.On Friday, Burris, an Oakland attorney who has filed numerous lawsuits against police departments on behalf of family members of people who have been shot and killed by officers, said, "My sense is clear that this was an unjustifiable shooting. "Based on his interviews with witnesses to the incident on the platform of the Fruitvale BART station in Oakland shortly after 2 a.m. Thursday that took the life of 22-year-old Oscar Grant of Hayward, Burris said he believes the Alameda County District Attorney's office should consider filing manslaughter charges against the officer who shot Grant. BART officials have not released the name of the officer who shot Grant. They said the officer has worked for BART for nearly two years.The officer has been placed on administrative leave and tested for both alcohol and drugs as part of standard BART police policy. CONTINUE READING..
Richard R. Johnson is the first to admit it was a bad idea.Recently laid off from a job building trailers in Elkhart, Ind., Mr. Johnson came up a dollar short at Martin’s Supermarket last month when he went to buy a $4.99 bottle of sleep medication. So, “for some stupid reason,” he tried to shoplift it and was immediately arrested.“I was desperate, I guess,” said Mr. Johnson, 25, who said he had never been arrested before. As the economy has weakened, shoplifting has increased, and retail security experts say the problem has grown worse this holiday season. Shoplifters are taking everything from compact discs and baby formula to gift cards and designer clothing.Police departments across the country say that shoplifting arrests are 10 percent to 20 percent higher this year than last. The problem is probably even greater than arrest records indicate since shoplifters are often banned from stores rather than arrested.Much of the increase has come from first-time offenders like Mr. Johnson making rash decisions in a pinch, the authorities say. But the ease with which stolen goods can be sold on the Internet has meant a bigger role for organized crime rings, which also engage in receipt fraud, fake price tagging and gift card schemes, the police and security experts say.And as temptation has grown for potential thieves, so too has stores’ vulnerability.“More people are desperate economically, retailers are operating with leaner staffs and police forces are cutting back or being told to deprioritize shoplifting calls,” said Paul Jones, the vice president of asset protection for the Retail Industry Leaders Association.The problem, he said, could be particularly acute this December, “the month of the year when shoplifting always goes way up.”Two of the largest retail associations say that more than 80 percent of their members are reporting sharp increases in shoplifting, according to surveys conducted in the last two months.Compounding the problem, stores are more reluctant to stop suspicious customers because they fear scaring away much-needed business. And retailers are increasingly trying to save money by hiring seasonal workers who, security experts say, are themselves more likely to commit fraud or theft and are less practiced at catching shoplifters than full-time employees are.More than $35 million in merchandise is stolen each day nationwide, and about one in 11 people in America have shoplifted, according to the nonprofit National Association for Shoplifting Prevention.CONTINUE READING.. The leader of Your Black Muslim Bakery expressed satisfaction on the morning Chauncey Bailey was killed, saying the journalist got what he deserved for taking on the troubled organization in his reporting, a bakery member told Oakland police in a recently discovered account given the day after the slaying.Bakery leader Yusuf Bey IV summoned the woman to watch a TV news story about three hours after Bailey, 57, was gunned down on his way to work on Aug. 2, 2007, she told homicide investigators. As they watched the report on the Oakland Post editor's slaying, Bey told her, "That will teach 'em to f- with me," she said.<Interactive Graphic: The Assassination Of Chauncey Bailey.>> he woman worked at the bakery headquarters on San Pablo Avenue in Oakland and stayed in Bey's room there the night before Bailey was killed, she said. The Chronicle obtained a tape of her account and police notes of her interview, but is not naming her at the request of authorities who say her safety could be threatened.The woman's statement came to the attention of the Alameda County district attorney only within the past two months, authorities said - mysteriously, in the file of a separate criminal investigation into the bakery. The lead police investigator into Bailey's killing, who has long been a friend of Bey's, did not mention it in his official account of the probe. 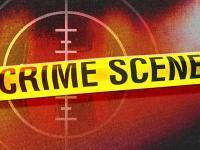 The belated discovery adds to questions already surrounding the police investigation into Bailey's death. The state attorney general, the district attorney and Oakland police internal affairs investigators have all launched probes into whether the Bailey case was handled appropriately. Assistant Police Chief Howard Jordan, the No. 2 officer in the department, said he knew nothing of the woman's statement before being contacted by The Chronicle on Friday.This is the first I've heard of it. I'm a little surprised," Jordan said. "I will follow up on it. I'll look into it and will take appropriate action when necessary. "21-year-old handyman at the bakery, Devaughndre Broussard, is the only person accused of murdering Bailey. But Broussard's attorney has said his client was the "fall guy" for a killing carried out at Bey's behest. he woman interviewed by police said she believed that Bey, 22, was behind the slaying and said bakery members would never have carried it out without his approval.Bey has not been charged with Bailey's killing, and one of his attorneys, Ted Washington, has denied that his client was involved. This time, Simpson verdict draws a muted reaction in L.A. The day after a Las Vegas jury convicted O.J. Simpson of armed robbery and kidnapping, reaction was largely muted in Los Angeles neighborhoods that 13 years ago were riveted by the not-guilty verdict in his double murder "trial of the century." 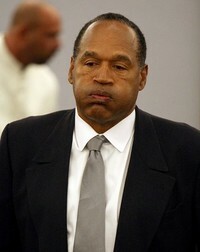 With the Miami-based Simpson no longer a presence in Los Angeles and many of the murder trial's old landmarks erased from the landscape, Los Angeles residents said the new case failed to resonate with them as they are consumed by more pressing issues such as the economy and presidential election. "There are way more important things going on in the world right now," said Lauren Lyster, 26, who was eating a muffin with friends at Peet's Coffee in Brentwood -- the spot that once housed Mezzaluna Restaurant, where victim Ronald Goldman worked. "Who cares about people committing stupid crimes?" Thirteen years ago to the day Friday, a Los Angeles jury acquitted Simpson of murdering his ex-wife, Nicole Brown Simpson, and Goldman. At the time, the trial stoked racially charged emotions, with many in the black community supporting Simpson. Two years later, Simpson was found civilly liable for the deaths and ordered to pay the victims' families $33.5 million. 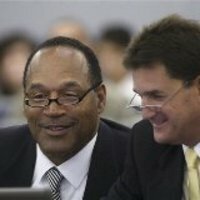 When he is sentenced in December in the Las Vegas case, Simpson, 61, faces a minimum of 15 years in prison. In his armed robbery trial, prosecutors contended that Simpson masterminded the alleged robbery of two sports memorabilia dealers in a casino hotel room last year. Earl Ofari Hutchinson, president of the Los Angeles Urban Policy Roundtable, said that local reaction to Friday's verdict was relatively subdued because the former football star's public image has changed. "In the 13 years, a lot has happened . . . The case polarized America along racial lines. With the passing of time, it's not as deep and not as passionate," Hutchinson said. "He represented a symbol: racial division. And it was questioning the fairness of the system," he said. "He was a symbol of that division 15 years ago -- he's not now." Nonetheless, Hutchinson said that because of the landmark case in 1995 and now his new conviction, "I don't think OJ Simpson will ever go away. "While Hutchinson said that race did not enter into Friday's guilty verdict, some blacks saw racial politics at work in the fact that Simpson faced an all-white jury in Las Vegas. (Two of the six alternates were black.) Outside McDonald's on Crenshaw Boulevard, Hank Myles said Simpson never had a shot at a fair trial. "If they would have had some blacks, he would have won, or at least it would have been deadlocked," said Myles, 78, a retired post office worker. "With all the black people in Las Vegas, they could have gotten some of them [on the jury]." Andy Brown, 32, a travel industry manager, said he had mixed feelings about Friday's verdict. "I just couldn't believe they actually got him on this as opposed to a double murder," said Brown who lives in Brentwood within five minutes of Nicole Brown Simpson's former condo. "I saw the look in his eyes, the way he was nodding his head, and I sensed that he was thinking, 'They finally got me.' " On the other side of town, at the farmers market in Leimert Park, DJ Ron "Rhythm" Gantt said he had not been following the trial closely because it was in Las Vegas. A Los Angeles resident, Gantt noted the difference between this trial and the cultural spectacle that played out in the downtown courthouse 13 years ago. "This time he didn't kill anybody, and he wasn't chased halfway through Los Angeles," said Gantt, 66, referring to the police pursuit of Simpson in his white Bronco televised live to TV viewers.